This is an undercover government inspector’s report to the U.S. Immigration Commission about the food served to steerage passengers on a ship that sailed from Europe to Baltimore in 1908. Breakfast always consists of a cereal, coffee, white bread, and either butter or prune jam. In the afternoon coffee and dried bread were served. The two Sundays we were out, this was changed to chocolate and coffee cake, which were quite good and greatly appreciated. These menus sound well and the allowances for each person were generous, but the quality and the preparation of much of the food were inferior. It is no doubt a difficult matter to satisfy so many persons of such varied tastes, but the [German] passengers [on this German ship] were as loud in their complaints of this cooking as any of the others. So simple a thing as coffee was not properlyprepared. I carefully watched the process by which it was made. The coffee grounds, sugar, and milk were put in a large galvanized tin can. Hot water, not always boiling, was poured over these ingredients. This was served as coffee. 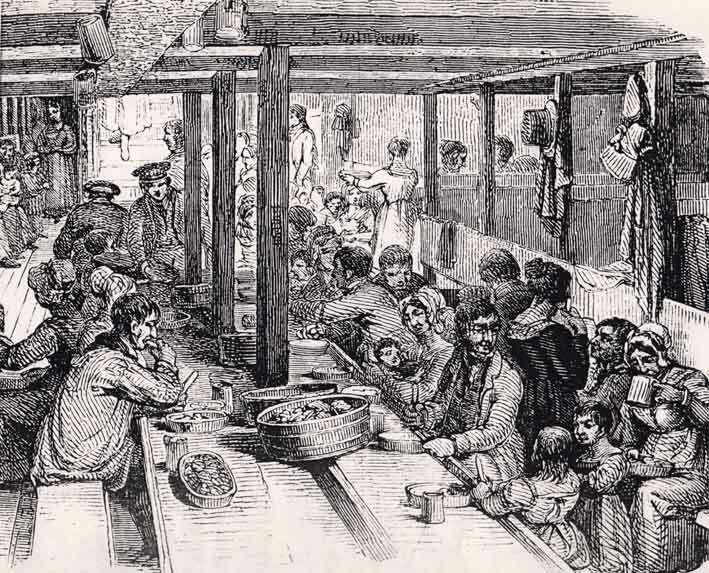 The white bread, potatoes, and soup, when hot, were the only foods that were good, and these received the same favorable criticism from passengers of all nationalities. The meats were generally old, tough, and bad smelling. The same was true of the fish, excepting pickled herring. The vegetables were often a queer, unanalyzable mixture, and therefore avoided. The butter was rarely edible. The stewed dried prunes and apples were merely the refuse that is left behind when all the edible fruit is graded out. The prune jam served at breakfast, judging by taste and looks, was made from the lowest possible grade of fruit. Breakfast cereals, a food foreign to most Europeans, were merely boiled and served in an abundance of water. The black bread was soggy and not at all like the good, wholesome, coarse black bread served [to cabin passengers]. During the twelve days only about six meals were fair and gave satisfaction. More than half of the food was always thrown into the sea. Hot water could be had in the galley and many of the passengers made tea and lived on this and bread. The last day out we were told on every hand to look pleasant, else we would not be admitted in Baltimore. 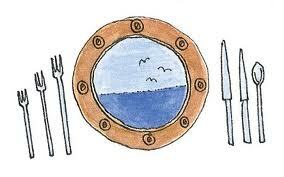 To help bring about the happy appearance, the last meal on board consisted of boiled eggs, bread, and fried potatoes. Those who commented on this meal said it was “the best yet.” None of this food was thrown into the sea, but all was eagerly eaten. If this simple meal of ordinary food, well prepared, gave such general satisfaction, then it is really not so difficult, after all, to satisfy the tastes of the various nationalities. A few simple standard dishes of fair quality and properly prepared, even less generously served, would, I am positive, give satisfaction. The expense certainly would not be greater than that now caused by the waste of so much inferior food. There was a bar at which drinks, fruits, candies, and other such things were sold. This was well patronized. Those who had any money to spare soon spent it at the bar—the men for drinks, the women for fruit. Several of them told me they simply had to supplement the poor food, and in doing so, had spent all they dared for apples and oranges.